I’ve been putting off the big task of scraping and painting my windows since last summer. Though I’ve replaced many of my windows, especially those in highly used rooms, the enclosed porch still includes 11 old windows, and the two in the back hall are also due for some fresh paint. I decided I would do it right, and scrape off the old peeling white paint before I put on fresh coats of primer and paint. My dad cautioned me to take my time and just do a few at a time. I bought the paint a couple weeks ago, but it’s been raining or humid each weekend, so today was my first chance. I pulled down the window screens on either side of the front door, since I could easily reach them without a ladder. I set up my scraping area on the driveway, shaded by the garage, and set to work. I quickly discovered a layer of black paint beneath the white paint. Apparently these windows had been black at one point, like much of the trim on my white house. But as I scraped (and scraped, and scraped), I discovered a layer of rust-red paint beneath the black. And more scraping revealed a bright blue paint. Finally, I realized that I could spend months scraping 13 windows all the way down to bare wood. Once I had scraped everything I could, I sanded things thoroughly, and then applied a coat of primer. I sanded and primed two windows today. I’ll paint tomorrow, and then repeat the process next week. If I bump it up to three windows at a time, I’ll be done by mid-September. But it’s kind of interesting to envision what my house would have looked like with blue or orangey-red trim. I have old black and white photos, but nothing in color. 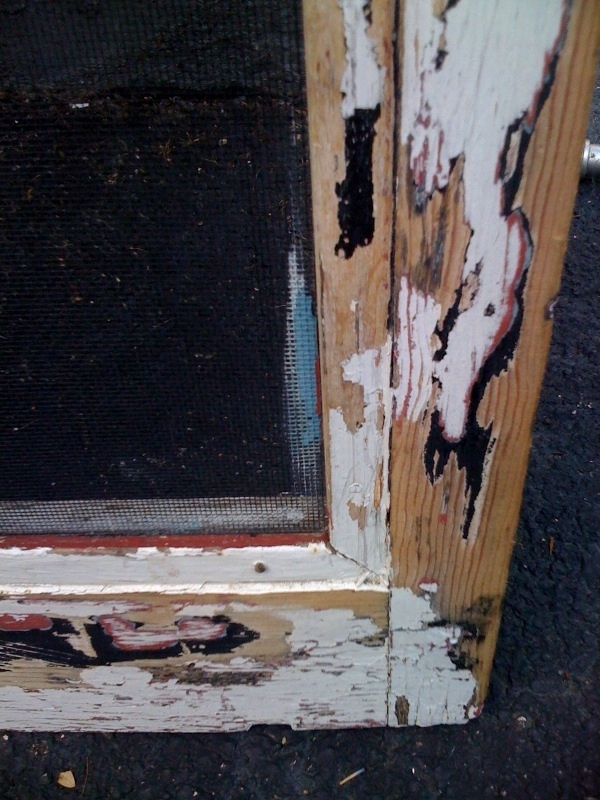 This entry was posted in House projects and tagged House projects, Old House Love, Paint & Stain. Bookmark the permalink.